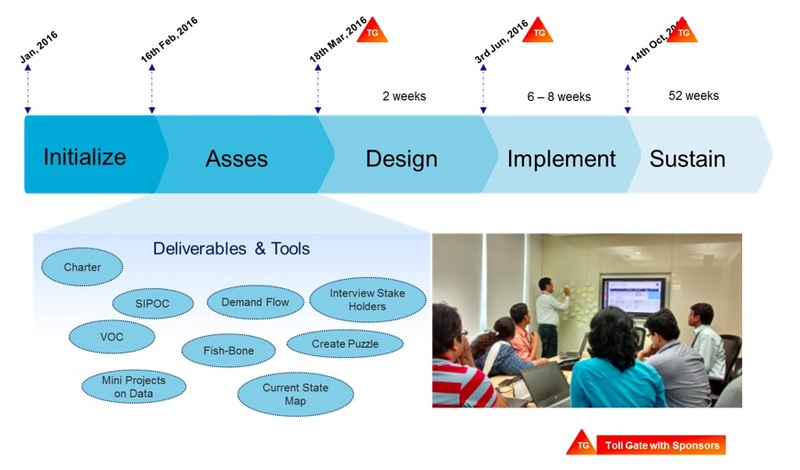 Read about applying lean principles in IT service delivery to improve quality and efficiency. Learn how to identify customer value through a structured survey and conduct workshops to assess each processes in the IT delivery life cycle (including development & testing) using Value Stream Map and to identify potential areas of improvement. Find out how to implement lean improvement ideas to eliminate waste and to shortlist potential root causes. See how you can identify candidates for automation on manual repetitive tasks. Learn how to integrate automation and lean to have a sustainable long term improvement framework in IT service delivery environment. In today’s world of disruptive technology innovation, needless to say that Lean Principles apply to any field of IT, and as we will see now, Lean Principles also apply to more than just manual processes in IT environment. About Ericsson: Ericsson is a global leader in delivering ICT solutions, carrying over 40% of the world's mobile traffic through its networks. It has customers in over 180 countries and comprehensive industry solutions ranging from Cloud services and Mobile Broadband to Network Design and Optimization. After successfully completing these lean programs, we focused on implementing the improvement levers across the organization to maximize benefits. The current ways of working result in overall repetitive manual tasks with avoidable waste of time and effort. This in turn results in lower customer satisfaction, low efficiency, less competitiveness and financial drainage. A lot of repetitive manual activities exist in every project delivery. Such repetitive manual tasks in the processes result in many defects, low efficiency and productivity. Most of the projects under one delivery unit are similar in terms of scope, deliverables and processes. There is low awareness in the team with respect to automating manual tasks and gaining efficiency. There is a strong necessity of further cost arbitrage and reduced cycle time for more competitiveness in the market. 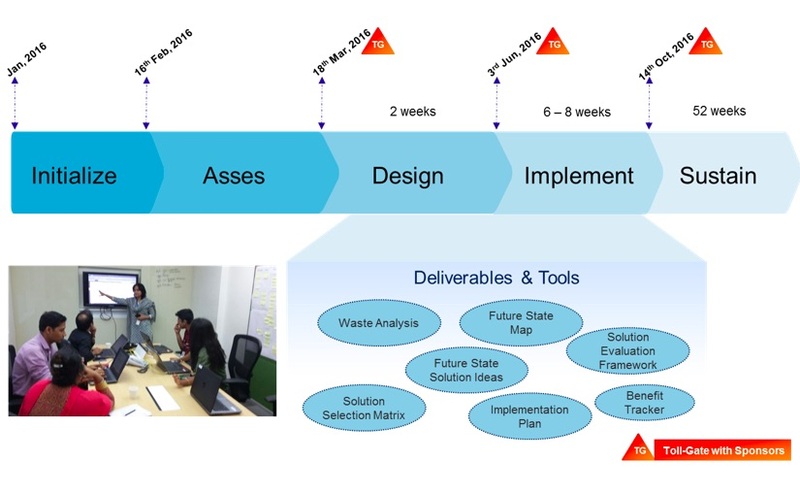 At this critical stage we initiated the Lean Automation Program with the aim of improving delivery speed, quality and efficiency through automating repetitive and effort intensive tasks performed in different customer projects across the organization. Automation of repetitive and effort intensive activities performed in service delivery processes for different delivery units in the organization. Improve efficiency through automation by 2% for the pilot implementation. This is translated as an overall target of 100,000 hrs. of effort savings in 2016. We will take a deeper look into how these goals were evolved in the next section when we discuss the ‘Voice of Customer’ to ‘Critical to Quality’ exercise for this program. As per our Lean Deployment Framework (ref. following diagram), we first defined a charter for aligning with the sponsor’s expectation and started conducting our workshops across locations through virtual collaboration with the deployment team which consisted of the program driver, lean coaches, automation SPOCs as nominated from each delivery unit, development lead, and developers (as needed from shared resource pool). This exercise is referred to as workshop 0 in Current State Assessment. And, finally, data collation to establish the relationship of these causes with CTQ. Thereafter, during workshop 2, the team conducted multiple interviews with different stakeholders for all process areas and came up with a detailed value stream map of the end-to-end process. Through these exhaustive workshops, the team acquired a comprehensive understanding of the process, analyzed wastes and earmarked improvement opportunities in repetitive manual tasks or to address high defect rates. The team further collected data on each of the activities and then prioritized them in order to identify the top contributing areas in manual repetitive tasks and high defect percentage. The majority of delivery activities are spent in repetitive manual activities in projects which do not add any direct value to the customer (please refer the following Pareto charts highlighting the top contributors in these areas). These have mostly become “business as usual” for all delivery teams across the organizations, and we spend little time analyzing such processes to find opportunities for improvement in an ongoing basis. For implementation/installation/upgrade projects: the solution document creation takes the highest effort followed by business logic migration and SIT/UAT. For solutioning/business configuration projects: end-to-end testing takes up most effort, followed by requirement gathering. Similarly, the highest number of defects are contributed by SIT/UAT, followed by solution document and business logic migration. As per the preliminary analysis, among all these areas, testing, migration and solution design are good candidates for automation where we can leverage significant benefits. 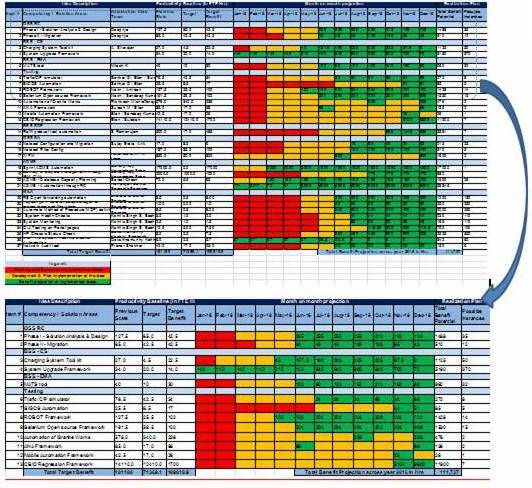 For many enhancement and upgrade projects: installation & upgrade documentations, deployment of tools, filter configurations, system upgrade, data migration, server and application monitoring, traffic simulation, notification framework database capacity planning, and network traffic analyzers were also identified for automation. During workshop 3, the lean automation team designed the future state of the value stream, eliminating wastes, addressing probable causes and bridging gaps through short term and long term solution levers. Finally, as a part of workshop 4, the team came up with innovative ideas for improvement through different techniques (namely - six thinking hats, affinity diagrams, and blue sky), translated them into practical solutions with proper definitions and then prioritized them for implementation with defined measurement criteria. Take up the top most contributing delivery process areas from the organization scope (both for high lead time and high defect). Identify improvement ideas within delivery processes from process mapping exercise. 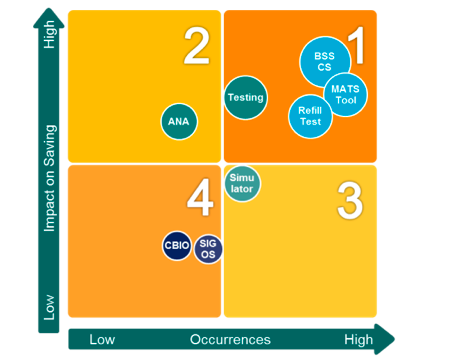 Shortlist solution levers for implementation from the Solution Selection Matrix (for maximizing the potential benefits across organization, solutions were shortlisted based on possible re-use occurrences and impact on the big goal using a Solution Selection Matrix as illustrated below). We worked with the resource management team in our unit to identify skilled engineers from the available resource pool in the organization, who had good knowledge in open source or open stack programming or good knowledge in scripting languages like Pearl, Python, Shell Script, PL/SQL, etc. They were on boarded into the automation core team for developing automation tools in different platforms and rolling those out for deployments in live projects in order to pilot. This team developed each of the ideas through centrally managed program facilitated by the Automation Core Team. The Automation Core Team created an initial benefit planning for quick wins and pilot implementations. We also worked on other big lever solutions for long term benefit. 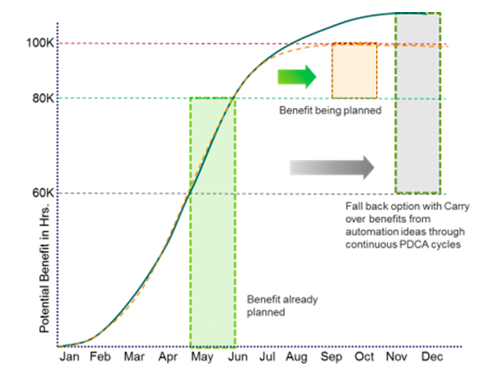 In the following benefit projection plan, it may be observed how post implementation benefits for each of the solutions, whether short term (starting immediately within a month) to long term (taking three - five months to implement and realize benefit) is planned for the entire year, along with the possible number of occurrences in each month. Once fully developed, each of the automation solutions were then implemented in identified customer projects. Benefits from these implementations were collected centrally by the Automation Core Team and reported to the sponsor on a regular basis. Post implementation, the core team then industrialized each automation idea and submitted it in our in-house central repository ‘Automation Knowledge Repository’ for future reuse in similar projects and on-going tracking of the usage. 160,000+ hours of savings achieved through automation by December 2016, against the yearly target of 100,000 hrs. 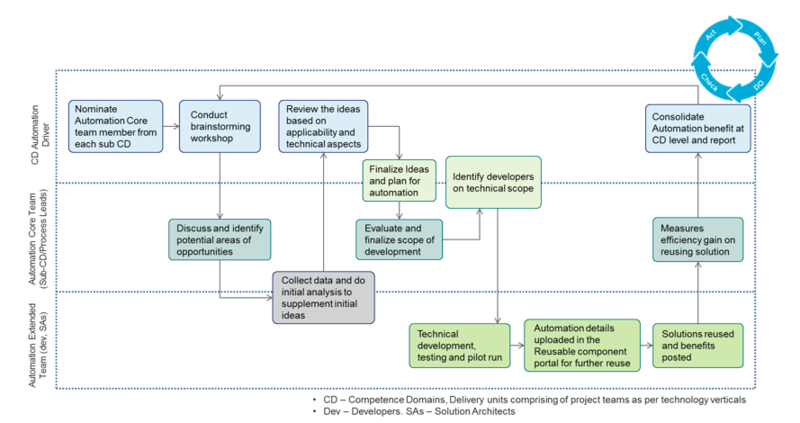 In anticipating challenges in extending the solutions across other process areas and client deliveries, we developed a plan for additional benefit and fallback options with carry over benefits from automation ideas through continuous PDCA cycles. This resulted in additional long term benefits for the organization in an on-going manner. Less manual repetitive task leading to less human errors. Thus, more time for learning, and value added activities for clients. Improved productivity and profitability for delivery teams. Hence, being more competitive in the market. Leveraging different technology environments for automation. Thus, opportunities for skill development in different newer technologies. Better understanding of the customer and business environment. Hence, better relationships with customers and improved customer satisfaction. In some way or another, all of us experienced challenges and resistance to any change from the status quo. And it is never easy to bring in changes to overcome such resistances. In general, the resistances to lean automation may be perceived under two categories: cost and people. And two of the most common benefits are efficiency and effectiveness. 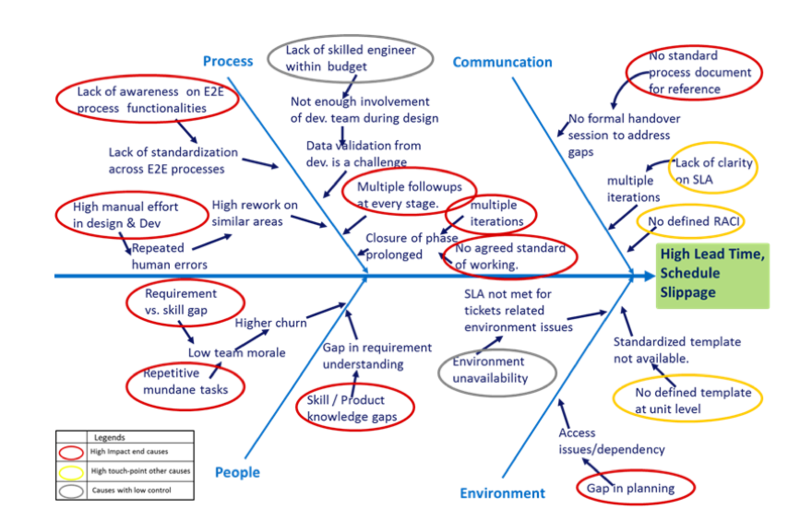 Both of these factors are convincing arguments to proceed with lean automation programs. The companies that implement lean automation early often see positive bottom line results from their efforts. However, cost savings are not the primary reason to automate IT operations. The focus should be on improving service to the clients and end users. As the quality of this service improves with automation, the costs associated with it also improve. Initially there was a typical perception about how automation would impact the overall workforce in the organization. It was extremely important and critical for us as the program driver to communicate appropriately with every employee of the organization, and raise positive awareness about the objective of the program across all units. We conducted team huddles and floor walks on a daily basis, followed by regular communications to all employees across the organization. After team members were on-boarded in the program, every one of them was highly committed towards the success of the program and tried to maximize benefit opportunities with possible opportunities for deploying each idea in upcoming projects. They embraced the Lean Automation program as a value driver in their delivery processes. During implementation, we realized that any change in the business pipeline could impact the benefit realization adversely – hence we worked on planning carry over benefits from automation ideas through continuous PDCA cycles. Completing deployment as per the timeline with the available technical leads from pool was a challenge many times, as employees would get assigned to customer deliveries as a first priority for the delivery organization. Therefore, we continuously planned back-up resources from the shared developers pool through-out the development and implementation cycle. Being a global delivery organization, it was extremely important for us to align the achievements at the global level, and to establish a common automation framework across the organization. Any program at the local organization unit level is often successful at first, but the scope is usually too narrow compared to the global objectives and strategy. Systems often fail because of the maintenance and enhancements required to maintain and expand the lean automation program pan organization. And, local programs are sometimes seen as expensive and then typically put as low priority. This is why most internally developed lean automation programs stall after achieving initial success. Customer benefit should always be the primary driver, albeit there might be some financial benefits which can only accrue to the organization. All the benefits’ baselines (both tangible and intangible) should be determined in the early stage of the program and then tracked on a regular basis. It is important to realize the quick wins which can be implemented early in the project and start reaping benefits. Some of the benefits arising out of the Lean Automation Program can be quite generic and applicable to other areas (yet to do lean or automation) – these should be extended soon to achieve more benefits to the overall program. The improvement charter needs to be drafted diligently after consultation with all the relevant stakeholders. Only those lean project team members should be selected who are keen, willing and able to devote the required time and contribute significantly. All the team members should attend the lean training and workshops so that they are able to appreciate the different lean tools and methodologies. With technology and services evolving faster each year, and growing customer demands, mastering the delivery has become the key to success - speed, quality and efficiency being the essential components. Innovation is the critical driver to succeed and survive in this competitive market; however both innovation and technology evolutions have increasingly become disruptive day by day. According to experts at The Boston Consulting Group (BCG) and Wharton faculty, lean and innovation can indeed complement each other, and it’s about time they came together. Lean brings structure and predictability to innovation, and sharpens the distinction between idea generation and the development process, they say. Both share a common goal: to meet customer needs in a cost-effective manner. And lean can help empower researchers and reduce uncertainty in the innovation process itself. While lean principles enable us to be effective and innovative everywhere we work, finding automation opportunities across every technology and customer focused processes can unlock a bigger potential for repeatedly delivering value to customers. Nevertheless, when implementing lean principles for automating IT operation, it's important not to forget the human element. Any company that is fully automated still has people working there, and as we all know, any lean initiative should focus on that human aspect carefully. Lean is about involving people and using their brain power to bring in further improvements in the system. No matter how we deliver IT software and services to our clients, the people part of lean are always a key piece of it. People are the key to identifying when something has gone wrong. With automation, it's easy to forget that IT processes are only as successful as the people behind them. By contrast, the Toyota Production System seeks to maximize the utilization of people. The goal of lean automation is to accelerate the frequency and impact of experimentation, thus to make more possibilities for disruptive innovations. And we, the IT engineers, must do as much experimentation as possible early in the process, during the lean automation design stage. Sudip Pal is Head of Lean Implementation & Execution for Ericsson India Global Services, SDU IT&C. With 18+ years of experience, his areas of expertise span across a wide spectrum of IT landscape – from System Integration to IT Service Delivery, from IT Advisory Services to Program Management, from Lean in Agile to Automation. He is a recognized Lean Expert by Asian Productivity Organization – Japan, Quality Council of India and National Productivity Council – India. He has mentored many big Lean deployment programs for some leading global IT companies in last eight years, such as improved cash flow & profitability, increased win rate, sales engagement process, scaled Agile, etc. In the past two years, Sudip has completed several high potential and critical transformation programs in the areas of Agile, Automation and IT Service Delivery Transformation Model. He has also groomed many candidates to become successful Lean Coaches in the industry.